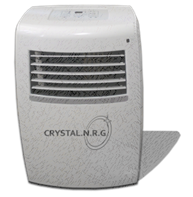 For the first time ever CRYSTAL.N.R.G has developed a range of consumer devices designed to run on clean natural energy. Since ancient times mankind has been aware of the primordial forces which flow through all things. Science may not be able to explain it but mystics, wiccans and geomancers have passed down this ancient wisdom from generation to generation - incontrovertible proof of the reality of these extraordinary phenomena*. So far, one question has remained unanswered: how do we tap this awesome powerhouse of energy? Could we, for example, run a laptop on crystal power? Could you boil a kettle with your aura? 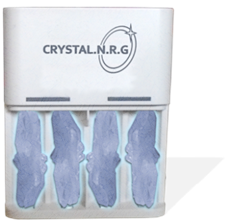 Finally, with the launch of a range of specially adapted consumer devices from CRYSTAL.N.R.G, the answer to that question is 'probably'. 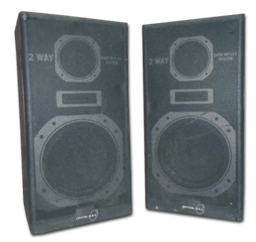 Check out our catalogue for details of our paradigm-shifting products. The Osiris represents the very latest in air conditioning technology and boasts a range of settings, including 'cold', 'medium' and 'slightly sticky'. The unit operates on pyramid power, channelling powerful Earth energies discovered by the ancient Egyptians. This handy ergonomically designed torch converts your aura into visible light, meaning that you will always have access to a battery-free source of illumination. As an added bonus, the strength of the beam can be used to measure your mood, provide an early diagnosis of illness and also predict what kind of day you're going to have next Tuesday. Energy crystals are a wonderful way of tapping into the deep electromagnetic rhythms of the universe but have a short lifespan, most lasting no more than 48 hours before they are completely depleted. That's no longer a problem thanks to our patent rechargeable crystals, which can be re-energized up to 400 times and are ideal for replacing batteries in a wide range of devices. 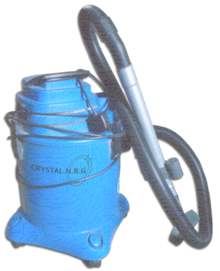 Wouldn't it be great if you could have a cordless vacuum cleaner that drew its power directly from Mother Earth? Now you can, because the Ley Vacuum operates entirely on the mystical prehistoric energy stored in ley lines. Comes with three interchangeable nozzles, spare bags and a nameless eldritch horror which will shadow your every step from now until the end of eternity. The perfect decoration for any festive occasion. 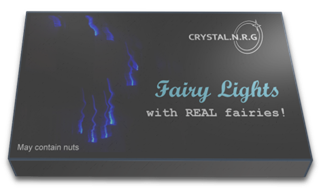 These charming and enchanting fairy lights contain real fairies and boast two modes: 'on' and 'off'. 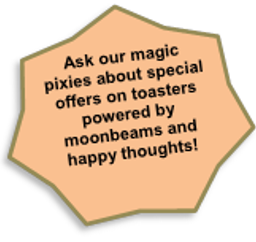 And for outdoor events, why not take advantage of our special bonus offer of a real dragon patio heater? One thing we get asked a great deal is how does all this work? What's the scientific basis for it? Is all this stuff for real? Well let's put it this way. Throughout history many talented and learned people have tried to understand the world around us. They have made careful observations, posited hypotheses, tested theories and gradually refined their ideas until they have arrived at robust, demonstrable and precise descriptions of the universe. Over the same period a different bunch people have dreamt up a lot of pretty-sounding nonsense that folk with a limited capacity for rational thought are more than happy to believe in. What's more, they've made a fat pile of cash in the process - this is the model on which we've built our business. It was either this or politics.